(From Pentax lens literature) Ricoh Imaging Americas Corporation (Ricoh Imaging) has announced the addition of the 08 wide zoom lens to its popular line of compact system cameras, the PENTAX Q. Touting the smallest, lightest compact system camera body available, the PENTAX Q line of cameras and assortment of lenses offers consumers a light and highly-portable interchangeable lens system. Designed for exclusive use with PENTAX Q-mount cameras, the 08 wide zoom lens is the most compact ultra-wide angle zoom lens available today. When mounted on a PENTAX Q7 body, the 08 wide zoom lens offers a flexible focal length of 17.5mm to 27.5 (in 35mm format). At only 38 millimeters in length, the 08 wide zoom lens is the perfect pocketable companion for on-the-go snapshots, landscapes, architecture and street photography where zooming flexibility is desired. Additionally, its optical design boasts a molded-glass DSA (Dual Super Aspherical) element minimizing distortion, while two ED (Extra-low Dispersion) glass elements and one super-low-dispersion glass element deliver clear, high-resolution images with edge-to-edge sharpness, while effectively compensating for chromatic aberration over the entire zoom range. The Q-mount lens series offers consumers a variety of focal lengths and apertures suitable for a wide range settings and subjects. Included in Ricoh Imaging’s lineup of PENTAX Q-mount lenses are a telephoto zoom, standard zoom, standard prime, fish eye, toy wide-angle, toy telephoto and mount shield. The new 08 Wide-Angle zoom lens will be available for purchase online at www.us.ricoh-imaging.com and at retailers nationwide in December 2013 for a suggested retail price of $499.95. Flexibility of focal lengths from 17.5mm to 27mm (in the 35mm format) when mounted on a Q7, perfect for on-the-go snapshots, landscapes, architecture and street photography where zooming flexibility is desired. Featuring an inner-focus mechanism, with an STM (stepper motor) drive for high-speed, low-noise auto focus operation for smooth and discreet shooting. 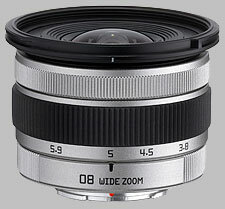 The Pentax Q 3.8-5.9mm f/3.7-4 08 Wide Zoom doesn't have any user reviews yet!